For a book with a personalized author autograph, you may order online through Bear Pond Books, here, and I'll sign your book before it's shipped to you. For detailed directions, see my HAY page here. 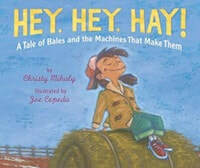 Read about what inspired me to write HEY, HEY, HAY, here; and more about my books and writing here. I love the magic and power of words, and I'm convinced that writing for kids is the best job ever. I'm always learning something new . . . about topics from the machines that make hay to eating invasive insects, from solar power to jumbo squids to the American civil rights movement. I write articles, stories, essays, poems, and children’s books. I'm particularly drawn to nonfiction, and am a founding member of GROG, the group blog for writers and readers of children’s literature. After living in Oregon, New Jersey, Georgia, Connecticut, New Hampshire, California, and Spain, I'm settled happily with my family in rural Vermont. There, I write at a table overlooking fields and forests, under the supervision of my dog and my cat. Want to know more about my “writing life”? Click HERE. Welcome! Feel free to look around! There’s information here about my books, events, and writing. Questions? Fill out the contact form.